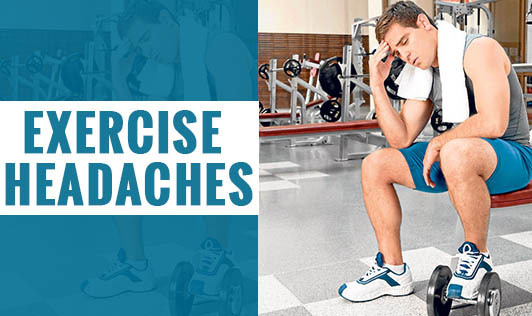 Exercise headache generally occurs during or after arduous exercise. Exercise headaches are associated with activities such as running, swimming, weightlifting and tennis. Primary exercise headaches are harmless and are not associated with any underlying problems. This can often be prevented without medication. The cause for primary exercise headaches is unknown. Secondary exercise headaches are caused by more serious problems within the brain such as a tumor, bleeding, or even problems such as coronary heart disease. The cause for a primary exercise headache is unknown. But, there is a theory that explains that strenuous exercise dilates blood vessels inside the skull. A primary exercise headache is characterized by throbbing that occurs after a strenuous workout, and affects both sides of the brain. This can last for about 5 to 48 minutes. Exercise headaches often tend to occur either when you're exercising at high altitudes or when the weather is hot and humid. Individuals who are prone to exercise headaches should avoid exercising in such conditions. On the other hand, some individuals may experience exercise headaches in the midst of a performance. Keep in mind that a warm up prior to strenuous exercise may help in preventing exercise headaches.